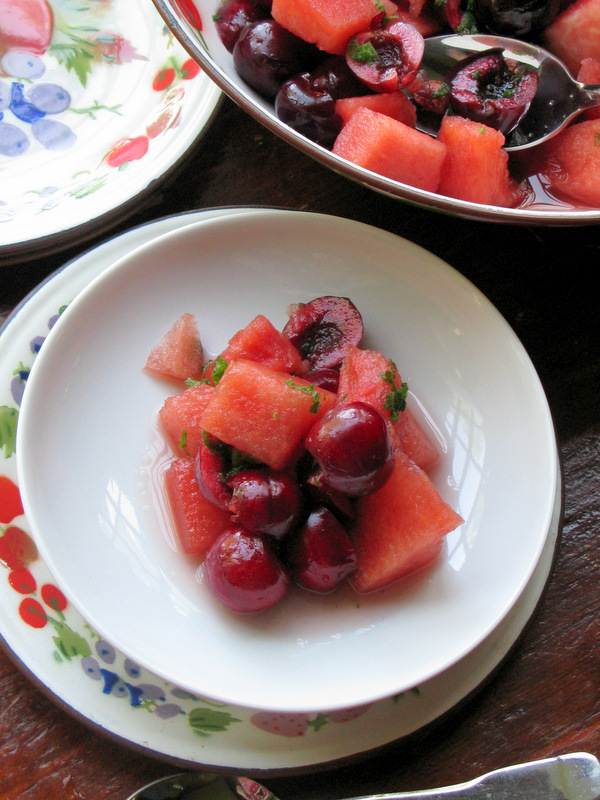 When watermelon and sweet Bing cherries are in season, I like to combine them in a refreshing salad. The textural contrast of the two pleases the palate and the lingering acidity of the cherries balances the juicy sweetness of ripe watermelon. Fresh mint syrup brings the fruit flavors together into something more than a simple bowl of fruit. To make the salad, give yourself enough time for the mint syrup to chill thoroughly before using. In the summer, we keep mint syrup on hand to use on peaches, in iced tea and in cocktails. It lasts for a month or more in the refrigerator. 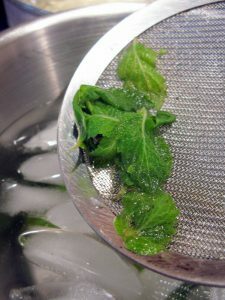 When making the syrup, blanching the mint is an important step. Don’t skip it. Blanching ensures that the mint keeps its bright color. 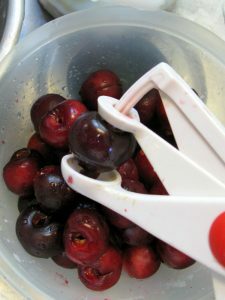 Pitting the cherries is a must. You can do it with a paring knife but a pitter saves the hassle and stained fingertips. 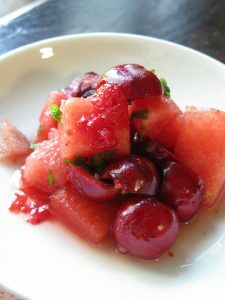 I quarter the watermelon then cut 1-inch thick slices of the fruit before removing the peel. This seems to save me time. I think this salad tastes best when served icy cold on a hot day. And add an hour or two for the finished salad to chill before serving. Coconut, lemon, raspberry or strawberry sorbet will dress up this salad. And many would welcome a splash of cognac or vodka right before serving. Pick the mint leaves from their stems to get about 1 cup of fresh leaves. Bring the water to boil in a small saucepan. Drop the mint leaves in the water and blanch them for about 20 seconds. Remove the leaves from the water, saving the water for the syrup. Refresh the blanched mint under cold running water. Drain the mint in a colander while making the syrup. Add the sugar to the water in which the mint was blanched. Cook over high heat stirring until the sugar dissolves. This will take about 2 minutes. Squeeze out all the water from the mint leaves then chop them into small pieces. Add the chopped mint to the sugar syrup. Chill the syrup for several hours or overnight in the refrigerator before using. Cut the watermelon into1-inch cubes. Or use a melon scoop to make nice neat pieces. 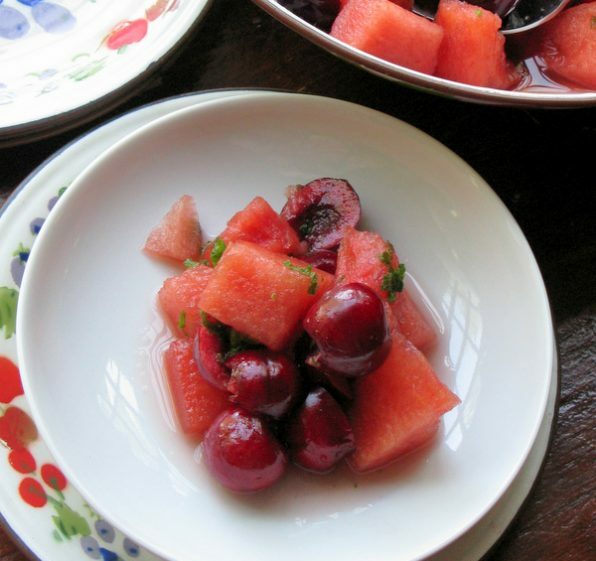 Combine the watermelon pieces with the pitted, halves cherries in a large salad bowl. Toss with the mint syrup. Serve immediately or refrigerate for several hours before serving. garnish the salad with fresh mint, some fruit sorbet, ice cream or a splash of vodka.